I'm excited to have just finished the first Lost Art painting of 2017! I'm in the States for the holidays, and as some of you know, I grew up in Eastern Pennsylvania, so it's fun for me when I'm back home to go around visiting some of the places I remember from my childhood and doing paintings there. 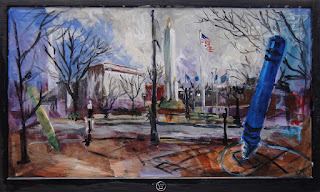 This week I had the opportunity to get down to Easton, and I sat in front of the old Crayola factory, where I had a view of Centre Square, and painted on this flat screen TV I'd found abandoned on a post-Christmas curbside. I hope that somebody finds it and gives it a home. It's always special and exciting for me when I get to do something back here in PA, and I hope I get the chance to hear from somebody here who's found one of my paintings. So if you're in the area, or know someone who might be, please share! I also hope you're all off to a great start of the year! And I look forward to doing a lot more painting when I'm back in Europe next week. Stay tuned! 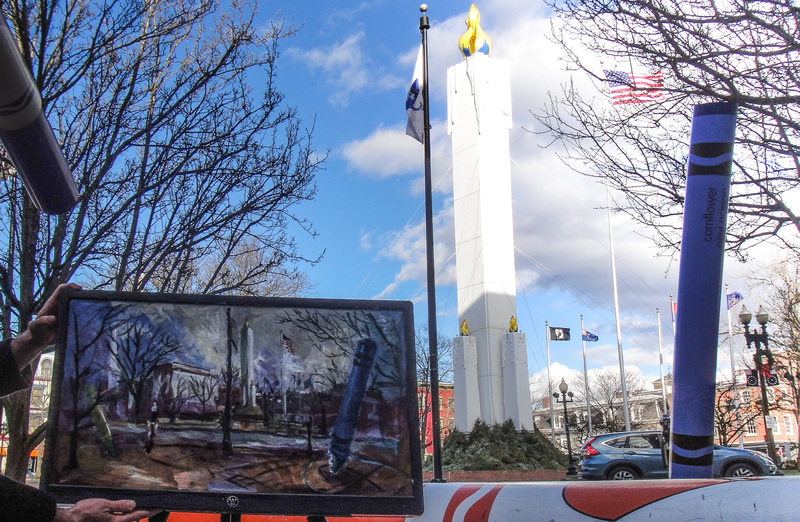 This painting, acrylic on found flat screen TV, 29" x 18", was left on the Centre Square in Easton PA, on January 4th, 2017 at 1:30pm.